Miles Newton (1762-1822) was a Waterbury farmer. He and his wife, Hannah, had at least three children. 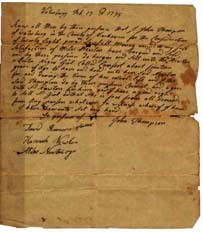 Miles owned at least one slave, Comfort Homer, whom he purchased from John Thompson in 1795. This may have been the John Thompson (1748-1801) who lived in the part of Waterbury that is now Middlebury. The 1790 census does not show him owning any slaves. Comfort was baptized in the Congregational church with Newtons children and with Lucy, a girl enslaved by Harmon Payne, and Paynes children, in 1801. 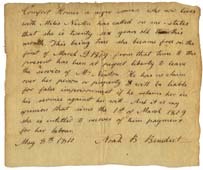 In 1810, Comfort sought legal assistance to gain her freedom from Newton, who apparently refused to accept that she was eligible for Gradual Emancipation and was not a slave for life. Comfort was declared to be free, because the date of her birth was within the provisions of the state law for Gradual Emancipation, and Miles Newton was told to pay her back wages. Comfort immediately left the Newton household. Comfort is sold as a slave for life to Miles Newton by John Thompson. Collection of the Mattatuck Museum. Benedict declares that Comfort Homer is a free woman and is owed back wages from Miles Newton. Collection of the Mattatuck Museum.